wow this is much better than simplux, i want to buy it but am kinder not fully occupied with internet, do you guys do installation to customers? if i have to buy this one now? Thank You for your kind words, I am glad you like it. We have just sent to you an email please read it. Nice theme. Is it okay with FX Tender Pro plugin? 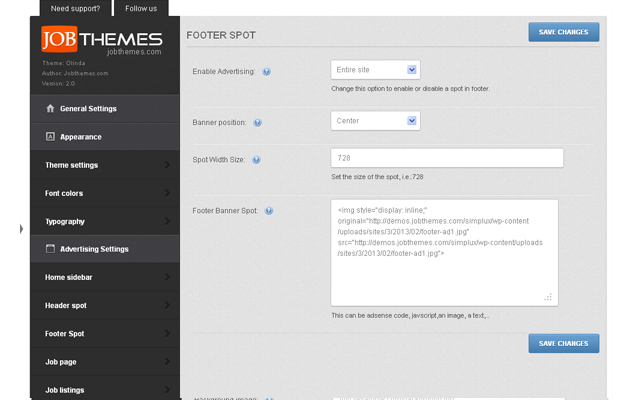 Yes it’s fully compatible with Fxtender plugin. Is there anyway to get the list pictures to scale correctly on the frontend? They look distorted on the homepage. Hi Yogamatt, Thanks for the comment. Yes there is a way, but we used the soft crop function to not compress the wide logos. We can easily set it to “strong” so even the logos with large width and smaller height they will fit inside the container of the logo, even if this will distort the shape of the logos themselves. This function needs just a value in a piece of code to be changed. Hmm. I guess the trick is to either not have them or require they be a certain size? The best trick is to maintain them to be square ( the height and the width dimensions are close or equal ). For the wide or tall logos, in a glance you can modify them by editing the media item to a better crop size. I will do these tricks for the demo. Hi. I really like your child themes, they are really impressive. If I want to create a listing of professionals and I want that to be my focus-on the front page. Which of your child themes would you recommend? Hi spartac, presales question ask, I saw some issues highlighted via forum and you have provided some temp solutions. You have mentioned that you are working on some update/patching, may I know when will it be ready? Thank you! Hi Adamngai,I am very sorry for this late reply, I am not sure why but we were not notified with all these comments and when I was checking daily, I saw no comment in my side. very weird, please forgive this delay, I have just seen all of them. All the issues were either resolved or explained ( most of them were not issues at all, but a misunderstanding or a misuse), anyway the next week, we are going to release a maintenance version for this theme. I am very interested in hiring you. Could you please tell us what do you need as custom mods? I have emailed you and sent you private messages via the forum…is there some reason you are not responding? Perhaps you are not somehow not receiving my attempts to get ahold of you? we are sorry for the delay to reply You, we have been facing an issue with the notifications received from the forums and comments, and the last week we couldn’t receive any pm in forums. Also, I have just checked our emails, yours was received in our spam box which we usually check out but not all the time. I am sorry for this lack of communication. I will talk to my co-worker, the one who received your custom work first time and get back to you.I am not aware of whether they finished that one or not. Spartac, I am sending another email. We received the second email in the spam, I white listed your email again, we keep communication through email, it’s better now. I will reply your last email in while. Sorry , we used to reply faster than this but due to the issue in the notifications, we cannot know whether we have new comments or posts, unless if we open each page manually. Thanks so much! I was getting kinda worried that you were ignoring me on purpose. What’s the next step? Will we communicate through email? Great. Looking forward to talking with you. I really need to know if this project can be completed. I have not gotten any kind of consistent communication from you, and at this point I am beginning to think you are unreliable. Please give me a yes or no on this. I have emailed 3 times, PM’ed 5 times, and posted here a bunch. This whole process has been about 2 weeks and has gotten nowhere. Please respect my time and tell me if this can be done or not. You have until Monday pacific time before I write a terrible review. You have been stringing me along far too long. I need answers to whether or not you can do the job I asked of you. It has been almost 3 weeks now. This is unacceptable. To say I am frustrated would be an understatement. We are sorry to hold you all this time, it was an issue in the system of notifications, as I said before, we cannot look everyday in every product’s page, every page of the forums to see whether we have new message. we talked to appthemes team and they fixed it by changing our email. I am not sure what do you mean by ” giving a terrible review ” , You had the full product and it worked fine, so it will not be fair to leave a bad review for something you already use and you like. 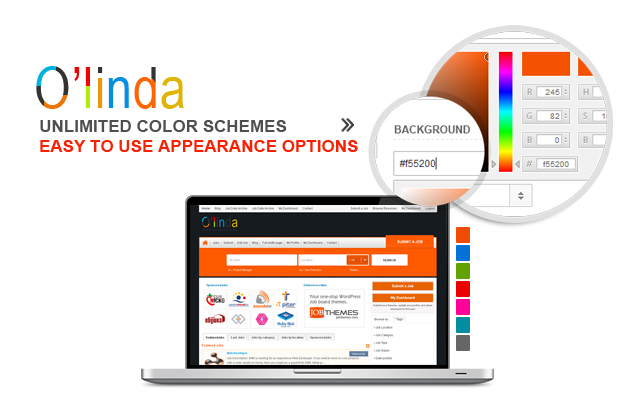 just because we did not do that custom work you asked for at time we were very busy updating our themes, one of them is Olinda that we sent a new version of just yesterday including more options and features. 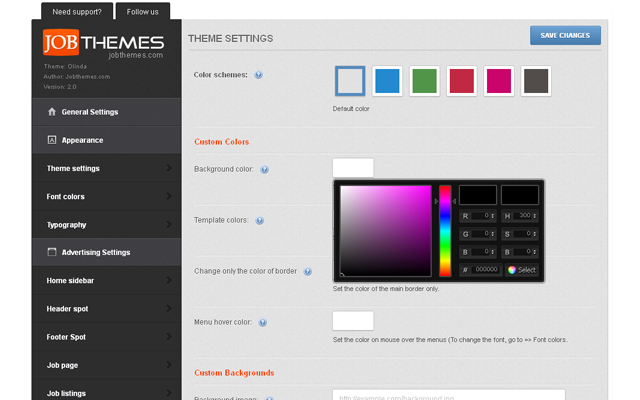 As you see, we try to satisfy all our customers and we never stop working on our themes. and if you go back to our previous conversations in the forums, You would see how fast and useful we were with You. The custom mod you asked for wasn’t that easy to implement and here is our answer to not get involved into it. for this reason, and the other because we will not know how to communicate with You after all these circumstances. So we suggest to hire a freelancer to do it for you and I believe there are plenty of them. We will stop doing custom mods, mainly the small ones of them. I am sorry one more time for the delay to reply You.It’s not like us at all. Come on…you waited 2 1/2 weeks to tell me no? I don’t understand. I can be a patient person. But I waited for quite a while for you to get back to me and honestly I don’t have that kind of time. You told me in the previous private messages that you were going to work on it and test it on your side. But then it turns out you did nothing. So what am I to do? It’s not exactly fair to your customers that you can’t communicate in a timely manner and you lead them believe you can do a job when you can’t. It’s too bad…I was really planning on paying you whatever you needed. This had been one the most frustrating customer experiences I have ever had. You are right in all what you said and it was our mistake to accept to work on custom mods while we had been so preoccupied with the updates and fixes. That decision we took not for the money itself – because we are here daily and we help everyone around even if it’s beyond the support agreement. and many times we helped people that they were not customers of ours. We decided to help You on that mod – by kindness- and the proof we started working on it, the word ” started ” doesn’t mean we finished it, but it meant that we opened the files and started searching for a faster and better solution for your issue (We sent no quote of cost or time frame, we just started on it without knowing how hard or easy it would be.. and during that we had that issue with the notifications, and as you see now, It returned to be as better as before, we answer instantly while others might take up to 24 hours for someone to get a reply. About our support, we support our themes, and what you asked for was a custom mod, so it wouldn’t be fair to judge the support that was always excellent with you in matter of fixing any issue you had with the theme, and to project it on a an extra custom mod that we did not even deal about it.. One more time, we took it as a kindness act – like we always help others so we said why not you, after we saw how badly you wanted that mod. so we intended to give help. But after this experience we better stop taking in charge to be involved in custom mods and we stuck by supporting our themes. that we dedicate a team of 3 persons to reply questions and resolve issues 24hours a day, 7 days a week. I am really sorry that this experience turned to be like this – I assure to you that we never had any intention to waste your time or to not reply You.. this is why we are here, to reply our great customers and to satisfy them. I will take you at your word. Thank you for replying to me. Can you recommend any other developers that might be able to handle this project? I am really sorry for this disappointment. Both are very talented and , kind persons and great developers. I emailed them. Would you mind sending them a message as well so I can get a speedy yes or no from them? I will certainly email them personally and try to convince them to work on that project. You and yogamatt like this. Thank you so much Spartac. Appreciate it. You are the most welcome, and once again I am sorry that we left a bad impression to you. You can always ask for our help, we would be very happy to serve you. 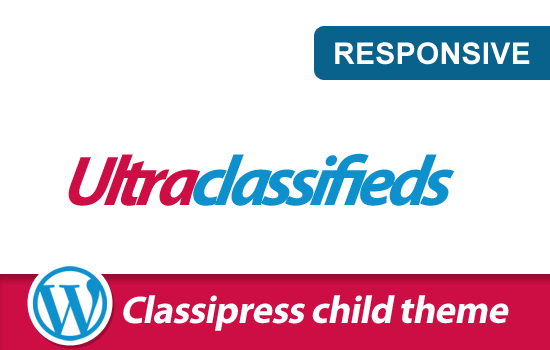 Can the child work on WordPress, without job roller app ? 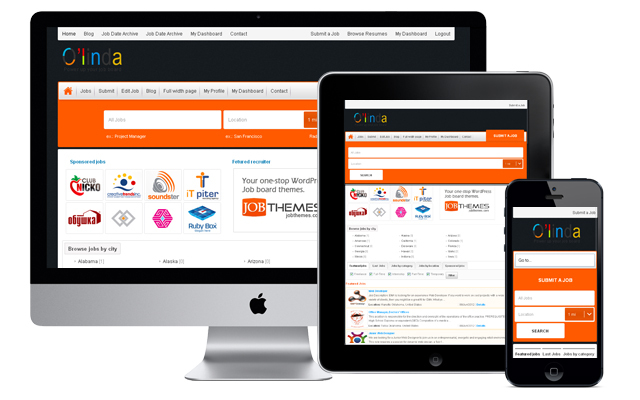 Olinda is a jobroller child theme and it requires jobroller to work, in the other hand, users get life time updates and double VIP support, from Jobthemes and Appthemes. It’s the best combination of a job board available in the internet for such price. Just wondering…how do I update the theme? 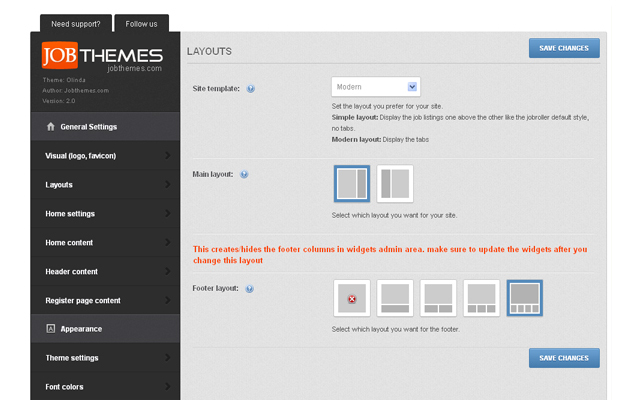 if you did not edit any code file, install appthemes updater plugin and launch the automatic update. Or, you can download it and upload (overwrite) the files manually. if you edit any file, we suggest to upload the files You did not change,and one by one. The difference between them is only the interface and the layout.one with solid design and the other with fresh one.Buth have the same options, settings and features. in Jobroller I find under dashboard : “pricings, gateways, transactions, etc” Where do I find this in O’linda or JobsApp? Or is it all under job plan? When clients pay to post a job, by electronic transfer from their account (and not by paypal), is het possible to make it automatically to put the job online (from pending to submit- after payment). Do I need a special plug-in? 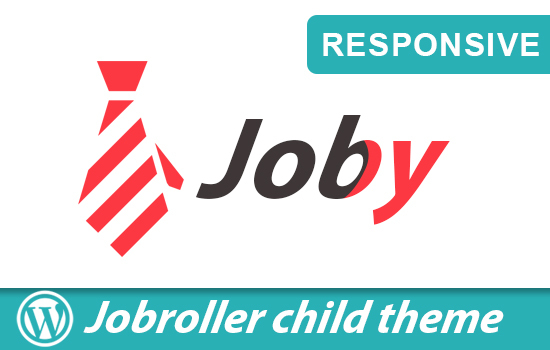 Jobsapp and Olinda are Jobroller child themes, so you’ll find all the settings and features of jobroller. Do you think you can help to custom make/add this 2 button (top right of http://www.jenjobs.com) on the theme? If you purchase Olinda, You open a thread in its forum and we can help you to add the 2 buttons in the theme. As they are static buttons, so it will not be hard to do it. have you done any custom mods to your themes ( olinda or jobroller)? i cannot submit any job postings forms do not show.! Create a new thread in the forums so we can assist you in that. pm me your url so I can see . If you did not edit anything, grant me a temporary admin access so I can check out the settings. I will check it out, but it’s preferred if we keep the support via the forums. I am going to read it and reply You by email. Could you send your email again to contact@jobthemes.com? I cannot find the first one ! Thanks so much for Fixing my install, i guess it was just my FTP client that seemed to corrupt the upload?!.. I really couldnt understand why wasnt working.. But thanks so much being super quick and now it works great! Yes Stevie, Certainly it was an ftp corrupted upload. I am using the Olinda child theme. I want to know how to add company information on the site. 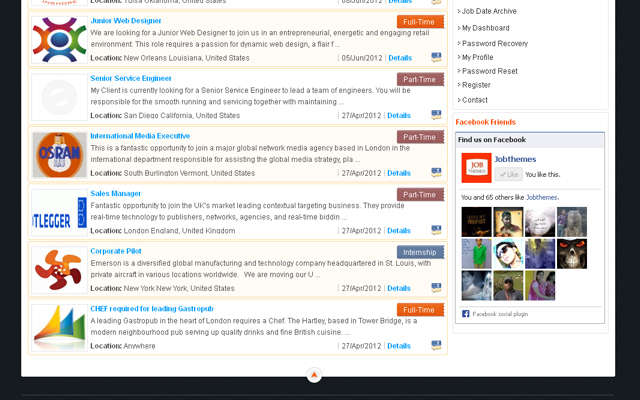 My wish is to have companies profile that can be displayed with relating postings. a skilled wp developer is required here. You can post this small task at codeable.io as there is no easy option for this one. I usually add Google map details to my job postings. I want the map to display on home page. Please, advise. there is no option for that except if you use a plugin for that. Change the color from Orange? On the screenshots I was led to believe that there was full custom options to change the colors. The Submit A Job box is just an orange box. Jobsapp, olinda and simplux wich one is best? Is there any planned update for Jobroller 1.8? It’s done, we are going to publsih it today.